The Fink truss is the type most commonly used in the United States for the roofs of small buildings. It is economical because most of its members are in tension and the struts are short. Fig. 3 is the form of Fink truss commonly used for spans of from 30 ft. to 40 ft.; Fig. 4, the form used for spans of from 40 ft. to 55 ft.; Fig. 5, the form used for spans of from 55 ft. to 85 ft.; and Fig. 6, the forms used for spans of from 85 ft. to 100 ft. If the slope of the roof is small, some form of English truss will be preferable to the Fink truss, because it gives better intersection angles. 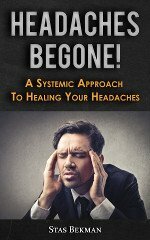 If the roof is hipped it is necessary to have vertical members to which to fasten the hip rafters. Figs. 7 and 8, respectively, show a Queen truss and a Fink truss of the same span and pitch, and both with vertical posts. It will be observed that the longest vertical strut in the Queen truss is avoided in the Fink truss. Figs. 3 to 8. 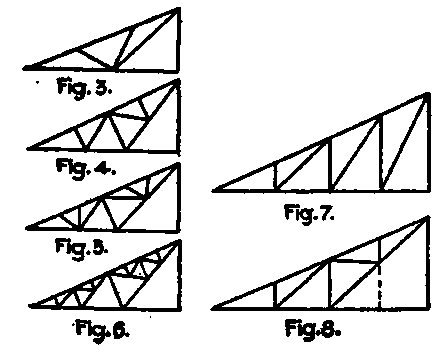 Diagrams of Common Forms of Roof Trusses. For small spans up to say 30 ft., sheets of corrugated iron may be curved and provided with a single tie-rod across the bottom to form an arched roof. This construction can often be used to advantage for ventilator roofs. The allowable slope or pitch of roofs depends upon the kind of covering or roofing employed. The allowable slopes for some of the more common roof coverings are shown in Table IV. It is more economical to employ horizontal bottom chords for roof trusses, or at least to keep the cumber down to an inch or two, since it avoids any bending of the bottom chord laterals. A truss whose bottom chord has a rise of two or three feet, however, presents a better appearance. The neutral axes of all chord members should intersect in a common point at each intersection. Flat iron should not be used in roof trusses, except for connection plates, as it lacks the necessary stiffness. Steel is a superior material to timber for roof trusses, because it is lighter, stronger and more durable. For the least weight of purlins the distance between supports must be a minimum, and since the weight of trusses is directly proportioned to the load upon them, the least total weight of trusses and purlins will be when the trusses are placed close together. This reasoning assumes that it is possible to realize practically the small sections required for the truss members, which it is plainly impossible to do. Experience shows that the most economical distance between centers of trusses for small spans up to say 50 ft., is from 10 ft. to 16 ft.; for spans exceeding 50 ft. it should be from one-fourth to one-eighth of the span, depending upon the nature of the roof covering and purlins. For plank laid directly on rafters spacing should not exceed 8 ft. for 2-in. plank and 10 ft. for 3-in. plank. Jack rafters need not ordinarily be used in mill buildings. When, however, the distance between trusses exceeds 20 ft., it will be more economical of material to run a few heavy purlins from truss to truss to carry one or more jack rafters which in turn support the small purlins upon which the roof covering rests. This construction was used in most of the buildings for the Columbian Exposition at Chicago and in many of the roofs for large train sheds which have recently been constructed. A great variety of roof coverings are available to the engineer. In selecting a roof covering the principal things to be considered are the cost and the necessity or not of having it fire-proof Figures of slopes required for various ordinary kinds of roof coverings are given in Table IV. It should be remembered that the material requiring the greatest slope will require the largest amount of covering. Table IV. Showing Least Pitch of Roof Required for Various Kinds of Roof Coverings. least pitch = 1/4 span. The building laws of the principal cities specify the conditions under which fire-proof roof coverings shall be used and also state what coverings are to be classed as fire-proof. Where this matter is not specified, the engineer must decide whether or not the risk warrants the use of fire-proof roofing, keeping in mind always that the cost of insurance on fire-proof buildings is less than for buildings which do not come within this classification. When the risk is inconsiderable a covering of some of the best brands of roofing paper makes in every respect a first-class roof, since this material is cheap, is easily applied, will last for years, and does not transmit cold as do metal or slate. Metal roofing is soon destroyed in buildings where corrosive gases accumulate. If warm air comes in contact with the underside of the roof the covering should be laid on boards or have some kind of anti-condensation lining. Figures showing the comparative costs of different kinds of roof coverings are given in Table IX.